Mark Townsend - Who is Mark? Mark’s ministry as a Priest is inclusive and ecumenical. He was ordained through the Church of England in 1996. For the last four years he has worked outside the officialdom of the Church’s ministry as an illusionist, using stage magic to teach and lead people into faith, mystery and enchantment. Over that period Mark’s searching spirit brought him into contact with many whose beliefs were different to his own which gave him an appreciation of the diversity of faith beyond Christianity, especially the nature based traditions of the British Celtic culture. Mark sees a spark of the Divine in all people, no matter what faith, culture, sexuality or background. He remains a Christian and the C of E will always hold a special place in Mark's heart; however, he now feels it does not allow him the freedom to be the open and eclectic priest he naturally is. In July 2010 he decided to hand in his 'Permission to Officiate' and resign his membership of the Church of England. It was a huge decision for Mark, but he feels more able to be a good friend of the C of E on the outside than an unhappy Cleric within. Mark has been an Independent Priest since June 2011. His ‘Parish’ has no geographical boundaries, leaving him free to offer his services and ceremonies to all. As an Independent Priest and member of the Progressive Christian Alliance (PCA), Mark is able to express his open vision of Christian Priesthood in a fully sacramental way. Among the services offered is an Open Table (Holy Communion for anyone who desires), rites of passage from the traditional to the avant-garde, house blessings and ceremonies to mark special occasions such as anniversaries and civil ceremonies. Mark has over thirteen years' experience of creating and performing special ceremonies enabling people to truly express themselves in a relevant and authentic way, with no attempt to change their beliefs. His work bridges the gap between formal religion and secular humanism with services that draw upon his eclectic spiritual experience as well as his Christian heritage. 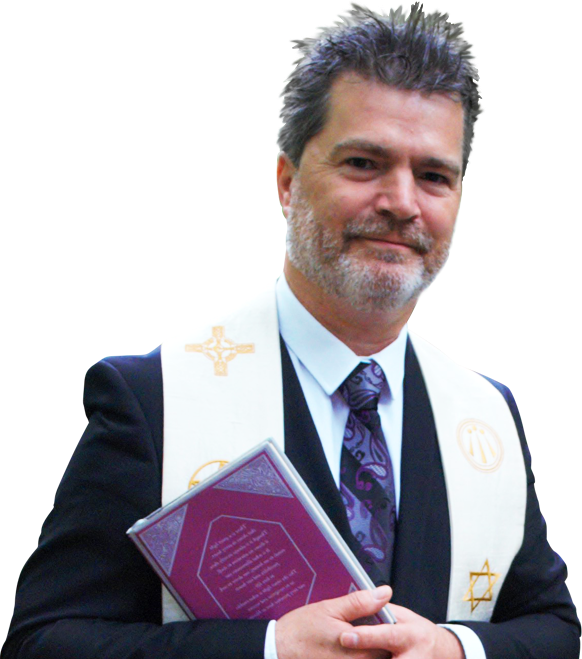 Mark is a professional Celebrant and a member of the Association of Independent Celebrants (AOIC). Please see their website (link below) for additional advice and information on planning for rites of passage and special ceremonies. One of the greatest blessings of the last few years is Mark’s discovery of the earth based path of Druidry, which he sees as totally compatible with Christianity. Most modern Druids see their path not so much as a religion but more as a philosophy, which means that there are many who follow the Druid ways and yet remain Christian, Jewish, Buddhist or even Atheist. As a Christian member of The Order of Bards, Ovates and Druids (OBOD) he weaves many of the beautiful customs and rituals of this essentially British nature tradition into his ceremonies and services. In doing so he walks in the footsteps of saints like Francis of Assisi who was a deeply earth based pilgrim and who sang canticles to brother sun, sister moon and mother earth etc. Two of Mark's Mentors send him their blessing on the advent of his new ministry as an Independent Priest.